Over the years not only has the Hunterian Society been peripatetic in its meetings venues but so also have its collections, records and libraries historically accrued in one place only to be moved or dispersed to others. It should not be an occasion for surprise then to learn that currently the ‘Collections’ are divided in twain….but united by their Catalogue! The Records, Collections of Manuscripts and Books and other Printed Matter plus Pictures, Portraits and Prints of the Hunterian Society of London are deposited in The Wellcome Library, 183 Euston Road, London NWI IBE. 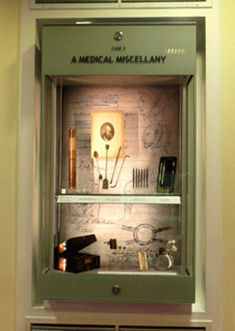 The rest of the Collection is kept at the London Clinic where many of the artefacts are on permanent display in four beautifully designed cabinets. 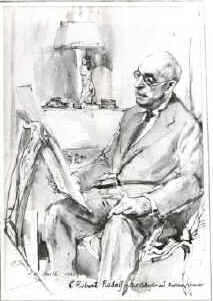 The Society is deeply grateful to the The Wellcome Library for the continuing care they give of the Hunterian Society Collections; the support of the London Clinic; it salutes the late Mr. C. Robert Rudolf for the signal support he gave in the acquisition of much of the modern Hunterian Society Collection and for his Bequest which funded the printing of its Catalogue. It remembers with affection the late Mr. Alastair Kingsley-Brown, former Honorary Secretary, Orator, and President who, as Curator, secured the good custodianship that the Collections possess. 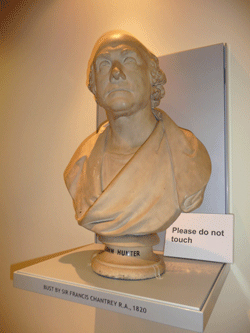 Scholars will note that the most prestigious assembly of ‘Hunteriana’ is that collection initiated by John Hunter himself which is ‘held for the Nation’ in the Hunterian Museum of the Royal College of Surgeons of England , 35-43 Lincoln’s Inn Fields, London, WC2A 3PN. 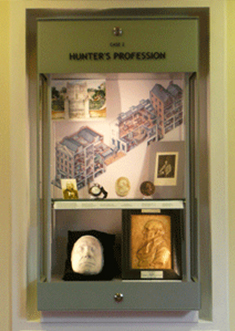 John Hunter’s elder brother Willam Hunter’s life and work is celebrated at The Hunterian Museum and Art Gallery of the University of Glasgow, G12 8QQ, Scotland. 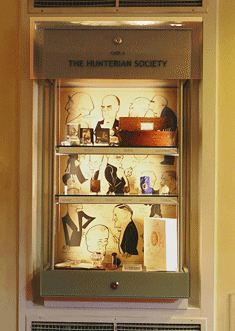 The Hunterian Society, supported by generous monies of the Rudolf Bequest, constantly seeks the acquisition of new objects to add to its collections of Hunteriana. The Honorary Curators would be grateful to learn of any such material related to John Hunter which the Society might be interested to purchase.